Well another spring convention has wrapped up and what a convention it was. Thank you to all those who attended the AMTA-IA Chapter’s Spring Convention at Prairie Meadows Casino in Altoona. A thank you to Bob McAtee as well for coming to give a great educational class. Congratulations to Holly Rasmusson re-elected to Board Member 1 position, Pam Burnikel re-elected to Financial Administrator, and Alexander L. Collins elected to our Delegate position. I would also like to extend a welcome to the board to Bill McArtor our new CSMT Chair, I know you will be great at it. As I stated at convention our National Office will be coming in June to give us an update on operating the new hub and getting our chapter set up with some of the new procedures being administered. I hope 2019 has started off great for everyone and I look forward to seeing everybody at our fall convention with Ralph Stephens in Coralville, Iowa on September 14th & 15th 2019. Check the Facebook page for more information. Have an excellent spring and summer and see you all in the fall. I recently discovered a new workbook for massage business owners. It’s called Massage Business & Client Scheduler for the Massage Therapist by Kamillya Hunter from Spa Analytics. If you were at the March Convention at Prairiemeadows in Altoona, you may already have this quarterly business planning workbook.The AMTA Iowa Board gave several away at the convention to assist you with your quarterly business goals. You can also pick this book up on Amazon. If you use facebook, there are several ways that this book is being used to help massage therapists throughout the country. Kamillya Hunter, the author, has a fb group called Massage and Spa Business Details That Matter. I encourage you to join and enjoy the reminders of what you could do each week for your business and your self care. Melinda Hastings, LMT, MTI, BCTMB, NCBTMB-Approved Provider, of Inspired Therapist Seminars, has created an online time management course using this book through facebook. 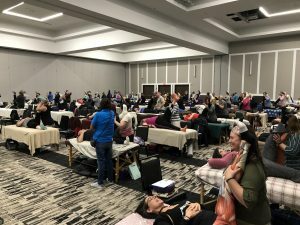 I took this course in March and encourage you to like and follow Inspired Therapist Seminars to learning more about thriving, not just surviving, in your massage therapy business. 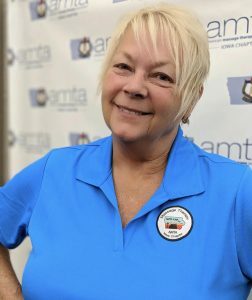 As your AMTA board member, I assisted the chapter with AMTA public relations work, grantwriting, funding and donations for our chapter. 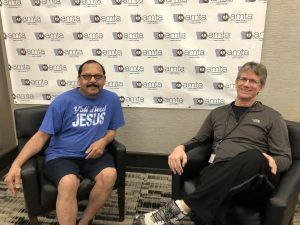 I attended the AMTA National Webinar on Government Relations Tools and Resources to learn more about grants, the Engage Advocacy Platform, Hub Government Relations conversations, and research an supporting materials for government relations. 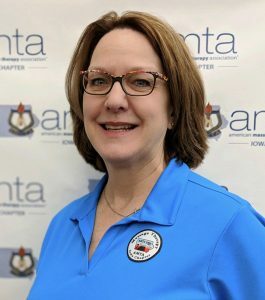 As your board member, I was active in AMTA public relations work by represented AMTA Iowa as a vendor at the Iowa Play Therapy Association Convention. 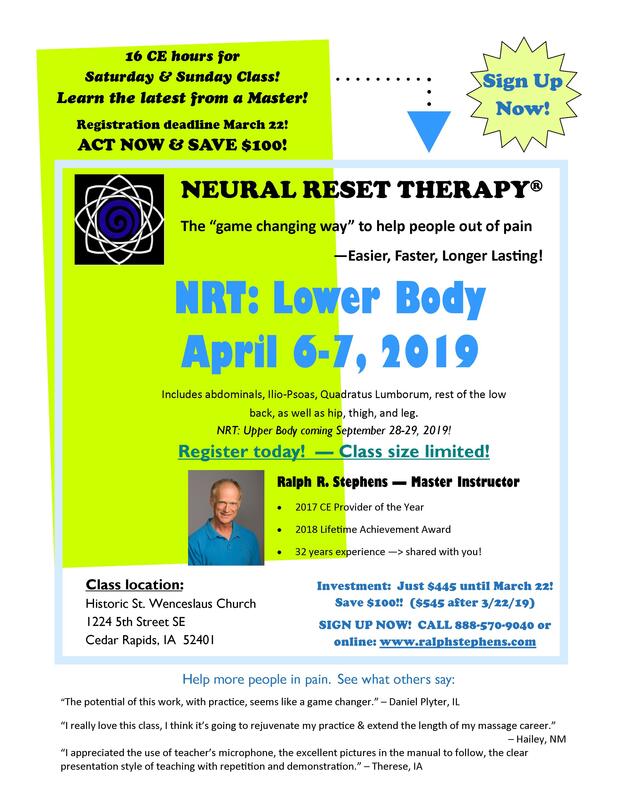 I hosted via live-streaming the 5th Annual Resilience Summit sponsored by the National Resilience Institute in Marion, and currently sit on the Linn County Resilience First Aid Task Force to represent massage therapy as an intervention during crisis events. I helped three AMTA Iowa members write grants for community service work. Informed the chapter of a new workbook out this winter for massage business owners; Massage Business & Client Scheduler by Kamillya Hunter from Spa Analytics. THIS BUDGET HAS BEEN APPROVED BY NATIONALS AND THE IOWA CHAPTER BOARD. THIS GIFT WILL BE AWARDED ANNUAL FOR PARTICIPATION AT THE SPRING CONVENTION (MARCH). THIS GIFT WILL COVER THE COST OF REGISTRATION. ALL OTHER COSTS WILL BE THE RESPONSIBILITY OF THE PARTICIPANT. 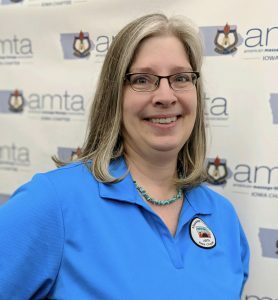 APPLICANTS MUST BE A MEMBER OF THE AMTA IOWA CHAPTER IN GOOD STANDING AND HAVE GRADUATED FROM AN AMTA SCHOOL MEMBER, LOCATED IN THE STATE OF IOWA, WITHIN ONE YEAR FROM THE DATE OF SPRING CONVENTION OR BE A CURRENT STUDENT AT AN AMTA SCHOOL MEMBER PROGRAM. 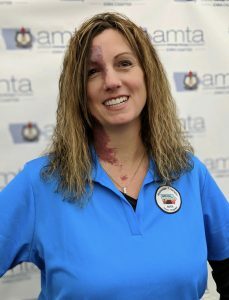 APPLICANTS WILL BE QUALIFIED THROUGH MEMBERSHIP REPORTS RECEIVED FROM THE AMTA NATIONAL OFFICE. 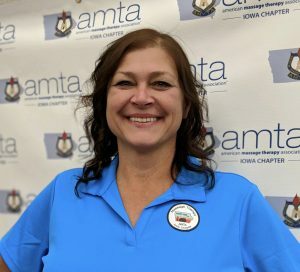 THIS QUALIFICATION WILL INCLUDE CURRENT, ACTIVE MEMBERSHIP WITH THE AMTA IOWA CHAPTER (AT THE TIME OF APPLYING FOR THE GIFT AND AT THE TIME OF CONVENTION) AS WELL AS VERIFICATION THAT THE APPLICANT ATTENDED OR IS CURRENTLY ATTENDING A SCHOOL WHICH IS AN AMTA SCHOOL MEMBER LOCATED WITHIN THE STATE OF IOWA. ADDITIONALLY, APPLICANTS WILL BE REQUIRED TO SHOW PROOF OF GRADUATION, INCLUDING THEIR NAME AND DATE OF GRADUATION, IN THE FORM OF A COPY OF THEIR DIPLOMA. IF THE APPLICANT IS A CURRENT STUDENT, A LETTER FROM THE SCHOOL’S ADMINISTRATION MUST BE INCLUDED TO VERIFY THEIR CURRENT STATUS AS A STUDENT. THE JUDY ROBUCK GIFT WILL BE AWARDED BASED UPON A WRITTEN REQUEST (NOT TO EXCEED 500 WORDS) OUTLINING WHY THE APPLICANT SHOULD BE CHOSEN. SPECIAL CONSIDERATION MAY BE GIVEN TO APPLICANTS OUTLING FINACIAL NEEDS. THE BOARD MEMBERS WHICH WILL DETERMINE THE AWARD CONSIST OF THE CHAPTER PRESIDENT, MEMBERSHIP CHAIR AND EDUCATION CHAIR. APPLICANTS WILL SEND THEIR ENTRY FOR THE JUDY ROCK GIFT TO THE AMTA IOWA CHAPTER MEMBERSHIP CHAIR. ALL ENTRIES MUST BE RECEIVED BY THE MEMBERSHIP CHAIR NO LATER THAN 45 DAYS PRIOR TO THE SPRING CONVENTION DATE. 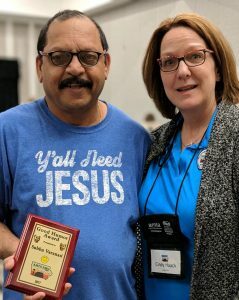 THE MEMBERSHIP CHAIR WILL THEN SHARE THE ENTRIES WITH THE CHAPTER PRESIDENT AND EDUCATION CHAIR AND A DECISION WILL BE MADE NO LATER THAN 30 DAYS PRIOR TO THE CONVENTION DATE. THE MEMBERSHIP CHAIR WILL NOTIFY THE RECIPIANT AND THE OTHER APPLICANTS OF THEIR STATUS REGARDING THE GIFT. SHOULD THERE BE NO APPLICANTS FOR THIS AWARD IN A GIVEN YEAR THEN THERE WILL BE NO JUDY ROBUCK GIFT GIVEN THAT YEAR. THE GIFT WILL THEN RESUME THE FOLLOWING YEAR (SPRING CONVENTION) AS OUTLINED ABOVE. I graduated from Carlson College of Massage Therapy in 2013. 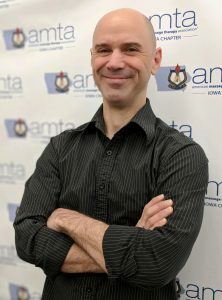 I am a current member of the AMTA and licensed with the state of Iowa. I enjoy working as a massage therapist and meeting each client’s massage expectations during their visit. The greatest joy of being a massage therapist, is hearing how wonderful you made someone feel after their massage. That kind of feedback from a client to a massage therapist, is simply priceless! 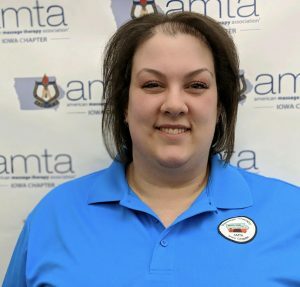 Each year at the Spring Convention we elect members in good standing to the AMTA Iowa Chapter Board. The positions we vote on during even years (2020, 2022) are 1)President, 2)Secretary, 3)Board Member 2, and 4)Delegate. The positions we will vote on during odd years (2021, 2023) are 1)Financial Administrator, 2)Board Member 1, and 3)Delegate. If you are interested in being considered in a board position you must apply no later than fourteen days prior to the spring convention. Please submit the following application form along with a 5 x 7 headshot photo to educationchair.amtaiowa@gmail.com AND digitalmediachair.amtaiowa@gmail.com so candidates can be announced in the winter newsletter to the membership. If you are interested on a board position please email this application and a 5×7 headshot to educationchair.amtaiowa@gmail.com and digitalmediachair.amtaiowa@gmail.com no later than 14 days prior to Spring Convention. Happy Spring Everyone! 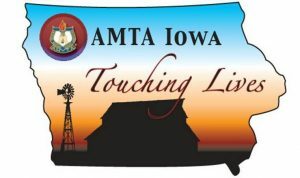 It was so good to see you all in Altoona for the AMTA-Iowa Chapter Spring Convention. 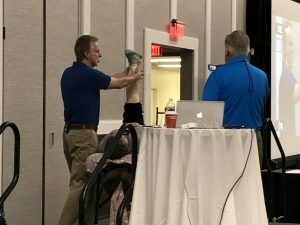 I hope you enjoyed learning Facilitated Stretching Techniques from Bob McAtee as much as I did. 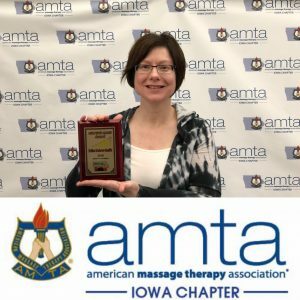 I would like to congratulate all of you who received awards for participating in volunteering at the following events held by our AMTA-Iowa Chapter. Sandra Black; Robin Marcus; Bill McArtor; Karen Sindelar; Kathy Lutz; Jodi Risse-Reitmaier. Sandra Black; Cindy Haack; Bill McArtor; Pam Burnikel; Jeanna Tellin; Soraya Wagner; Kathy Lutz; Sandra Burroughs. CONGRATULATIONS AGAIN TO ALL OF YOU!!!! 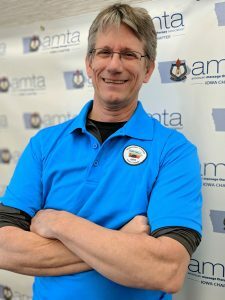 I’d like to encourage you all to volunteer for future AMTA – Iowa Chapter events. 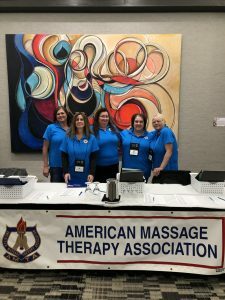 I’d also like to see how you can make a difference by educating your community about massage therapy and the benefits it has by giving back to your community. Looking forward to seeing you all at our fall convention! 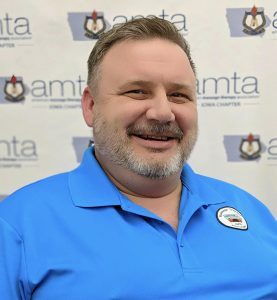 I just wanted to take a moment to thank the AMTA-IA members for allowing me to be of service to you over these past several years. It was my exposure to the leadership and members of the Iowa Chapter way back in 2011, while acting as teaching assistant to Ralph Stephens, that made me want to become part of the organization and consider serving in a larger role with the Board. You have a dedicated and knowledgeable group at the helm, right now, doing their best to support one another, you, and the whole of the profession in the respective roles. The Iowa Chapter has a stellar reputation within the larger organization that was earned, and has been maintained, by the people willing to volunteer their time and energy in the various Board and Chair positions we maintain. I encourage you all to be active participants in your Chapter and in this profession; we have a lot of challenges that need to be addressed with more to come. You don’t need to hold a position on the Board to help guide this profession toward a prosperous future.